Do what you want with it, just wash your hands after. Bethesda for their awesome game files,which I changed. After playing the game for a long time and being astonished by the amazing accuracy of even the most drugged out Raiders, and experimenting with playing without using VATS, I needed to level the playing field. I mean, seriously, these guys will shoot you from hundreds of feet away while you are both running, in the dark and in the middle of a rad storm like they are freaking Secret Service operatives. 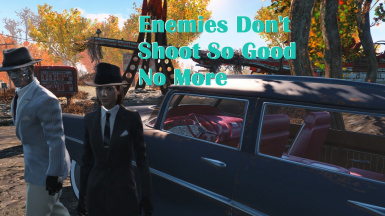 I went through the NPC combat values in FO4 Edit and reduced the Ranged Accuracy Multiplier for enemy NPCs with .esp and .esl. versions available at values of 50% and 75% vanilla Fallout 4 accuracy; the bad guys won't be so miraculous with a gun anymore. I didn't change any other records and left melee alone. All the named NPCs and bosses have also been left as is because, come on, these guys are the best for a reason. Raiders, Gunners, BOS, Robots, Synths, Coursers, BOS & Raiders in and out of Power Armor (they had different values), Blood Bugs, Bloatflies. I didn't want to do an across the board, flat value, but something that feels natural. I play a heavily modded game with most of the common mods installed and there doesn't seem to be any issues. Has been cleaned and checked with FO4 Edit. May conflict with other mods overhauling accuracy. Updated both esp and esl versions to include a couple of records I missed when creating the mod, now those damn Bloatflies aren't so accurate. .esp and .esl versions covering FO4 + both Far Harbor & Nuka World are now available. I haven't included Automatron as the combat style records seemed to be tied to the robot workbench models and I didn't want to mess with those. I believe the Raiders in Nuka World, Trappers, Hunters, & Ghouls in Far Harbor and Robots from Automatron get their combat scripting from the vanilla Fallout 4 records and the DLC records cover the new creatures.